This is my entry into the WEP April event. I’m a bit puzzled about where it came from, but it came and that’s how it is. I”m looking forward to reading the others as they publish! Those pearl earrings were mine, and I was going to have them back no matter what. I could almost see the long finger of caution wagging at me, but I ignored it as well as the boring reminder of my altered state. I didn’t need that. I knew my situation all too well. But, I didn’t quite know how I’d manage the heist and restore those earrings to my possession. That was going to take some unearthing of proper procedures. “Hmm. Unearthing.” I had the answer. All I needed was a willing digger. I just needed to find one. Next, I’d need an animator. There used to be one per village until the Inquisition, so there had to be some lurking here. The back alleys of this place were overflowing with unfulfilled entrepreneurs, and so I set out to explore an area I’d avoided since my arrival. A visit to this dark side held a few risks, but those pearls were worth it. I needed something to make me feel good about myself. It had been a long time since I’d had anything to make me feel like the Contessa Juliana Costa da Verdi. Of course, along my route The Voice nagged at me every step I took. “This is a terrible mistake. I knew that The Voice could only go as far as the entrance to the dark territory. While there was no line drawn, I felt a barrier as I approached, and so for a moment I stopped. “You will regret going in there,” The Voice said, and this time it sounded depleted. For a moment, I hesitated, but my desire for what was rightfully mine swept over me again, and before I could change my mind, I stepped into the blackness of the other side. I hadn’t expected the icy air or the odd smell of creosote. I’d always thought this place would be filled with fire and steam and smell of the unwashed. Well, it wasn’t.sI crept ahead feeling my way through what felt like a narrow canyon until I spotted a flickering light ahead. Moving closer, I discovered a small flame with a hooded figure huddled around it. It didn’t look up when I stepped into the light. The figure rose and towered over me. I was forced to look up at what I supposed was a face, but in this light and with the hood pulled down, I couldn’t be certain. “I am that.” It was a deep, animal sound that came at me. “Oh, well, then you’re exactly what I need.” This was far too simple. I’d have to tell that nattering Voice just how silly those warnings really were. “Come.” Like a shadow, the digger-animator moved back down the canyon, and I followed. It was a relief to come out of that dark place until The Voice started again. I think those words were followed by a sigh. Silence came after that, and I was left alone with the giant hooded figure. Without a word he led the way until we came to a familiar spot. Not my favorite one, but at least I recognized it, and I knew this digger-animator was going to complete the task. It didn’t take long to bring up the coffin. I really hated opening it, but it had to be done. And what a mess I was. I’d hoped some of the preservation techniques would have kept my lovely body in tact, but no. Before I recovered from the shock of seeing the rather vile remains of the Contessa Juliana Costa da Verdi, the figure placed a massive hand on her chest. And up she came. Juliana still had some kick in her. I smiled as I reconnected with the old, although greatly damaged, me. “Now, I’m off to fetch those earrings. Thank you,” I told my animator. I started away, stumbling over the uneven ground because no one had thought to put shoes on my feet for my burial. When I looked back, the figure was following me. Still it came along behind. I could make out a smile, but it had no humor in it. Wow! What a tale you weave. You had me hooked. Not easy to do. Well written. Concise neat story. Well done. Don’t worry about the origins of the muse. Let it do its thing. It did well! I guess if she could go back in time, she’d never ignore the Voice. Dark and disturbing. She should have listened to that Voice! I like stories that the story teller doesn’t know the origins of – the best stories come that way. Neat take on the prompt. I love the twist at the end of this story! Very well done! Ooh, I loved this! She definitely should have heeded the warnings. Thanks for sharing this brilliant story with us! Wow. I didn’t expect her to willingly become a zombie for those earrings, but I liked the twist (or what felt to me like one), and I liked the fact that she didn’t succeed the way she had hoped. It’s really an interesting story and one I’ll think about for a while. I don’t know what to say. It’s an interesting theory, one that I will avoid. I don’t want to come back for anything here. I imagine that some people will want to come back for something that they thought they could take with them, but I am not one of them. Well now, that is an interesting twist! So sad she was buried like that. And just wanted her earrings, but look what happened. Didn’t see that coming. Very nice work! I enjoyed this! Devil deals always benefit his agenda. There always seems to be a price, but making deals with hooded figures is asking for trouble. You seem to have an intriguing turn of mind for this challenge. I enjoyed it! There always seems to be a price, but making deals with hooded figures is asking for trouble. Especially when it wants to be paid in ‘soul’. You seem to have an intriguing turn of mind for this challenge. I enjoyed it! Nicely done. Seems like her greed got the best of her. What a fun and spooky story. Oh-oh! And every suffering that is ahead of her – just for a pair of earrings. Poor Juliana, indeed! Poor Contessa Juliana Costa da Verdi indeed, forever roaming between death and life. Didn’t get what she was expecting in the afterlife, poor dear. Wherever this story came from, Lee, it’s great. My kind of story. Love it. 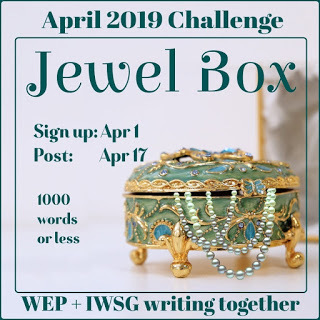 I’m glad you were able to come up with something for the Jewel Box prompt. I thought I had commented here… There’s a nice moral to this story, isn’t there. Nicely done. Nicely written. I always hate when people lose their souls, but it happens. Wow, intense and intriguing. Sometimes we need to listen to the advice we’re given. Awesome! Vivid characters and great dialogue!! It’s a little tough to be stuck between life and death! Doesn’t she know the soul sold is always one’s own? Geez. I thought that was common knowledge. I thoroughly enjoyed (not certain that is the right word) this clever and nasty piece.